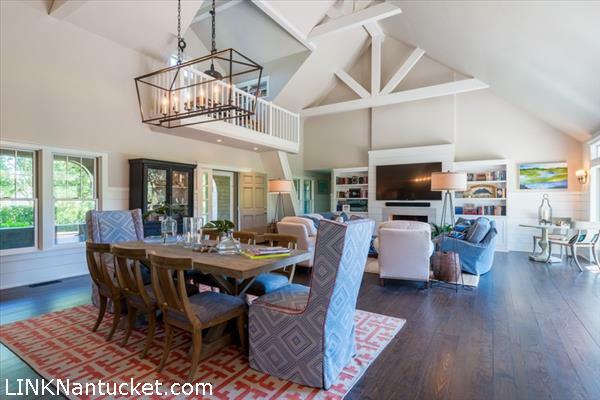 Stunning TURNKEY home renovated by Clarke Brothers and transformed into a casual elegant retreat by Nantucket Looms is perfectly situated south of Polpis in the upscale enclave of Tetawkimmo. Bordering acres of conservation land, with close proximity to Town, South Shore beaches, shopping and dining, this home is ideally located to avoid traffic and summer congestion. Many updates include new HVAC system, new mahogany deck, updated kitchen, and renovated master bath with steam shower, marble tile and adjoining outside spa shower. The dramatic âGREAT ROOMâ (a must see) is accented by a fabulous built-in wet bar, gas fireplace, ship lap walls, an 80 in flat screen TV with a super sound system. A spacious covered porch, another highlight of the home, is ideal for dining and relaxing. An oversized carriage style garage is perfect to accommodate a vehicle and all your recreational gear. The five bedroom septic system was recently upgraded to comply with the Nantucket Board of Health new regulations. Architectural plans for a 15 x 35 pool with landscaping and hardscaping has been approved by HDC. This 4 bedroom, 3 full and 2 half bath home is offered TURNKEY. Please send me more available listings similar to 5 Tetawkimmo Drive, Middle Moors. Thank you! Copyright 2019 LINK, All Rights Reserved. All Information believed to be correct but not guaranteed.